Are you on the hunt for a good January read aloud or set of sub plans? Here are resources to teach Sneezy the Snowman in kindergarten. You could plug and play these into your winter themed lesson plans or they can stand alone as a set of plans for a substitute teacher. If you haven’t read Sneezy the Snowman (affiliate) then let me tell you what it’s about or you can watch this cute teacher-made teaser for it. A snowman, who doesn’t like to be cold and sneezes a lot, keeps coming up with ideas to try and warm up… only to melt and have to be built again. This is a rhyming story that follows a pattern until the ending when the kids solve how to keep Sneezy at the right temperature. Here are the fun ideas and resources you can use to teach with Sneezy the Snowman. Create a simple snowman collage. 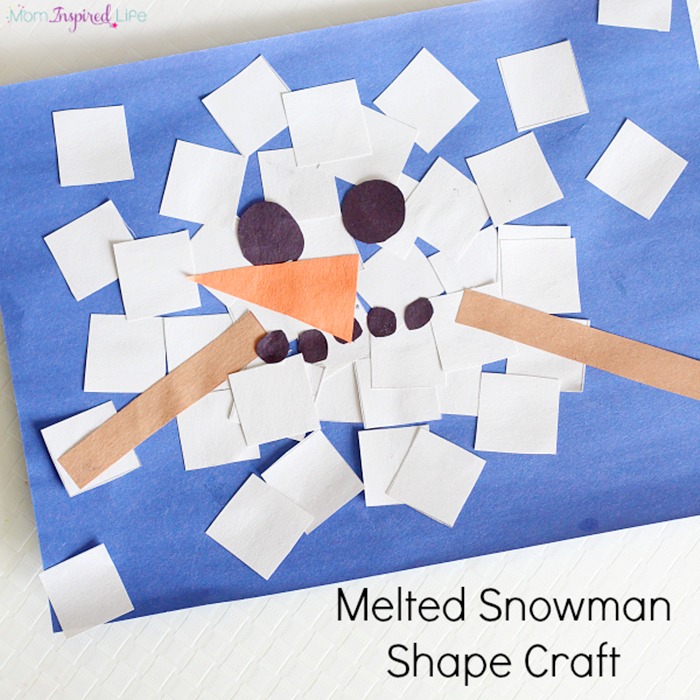 This melted snowman shape craft collage works on the standard of using 2D shapes to create things in the world. You only need construction paper, scissors and glue. 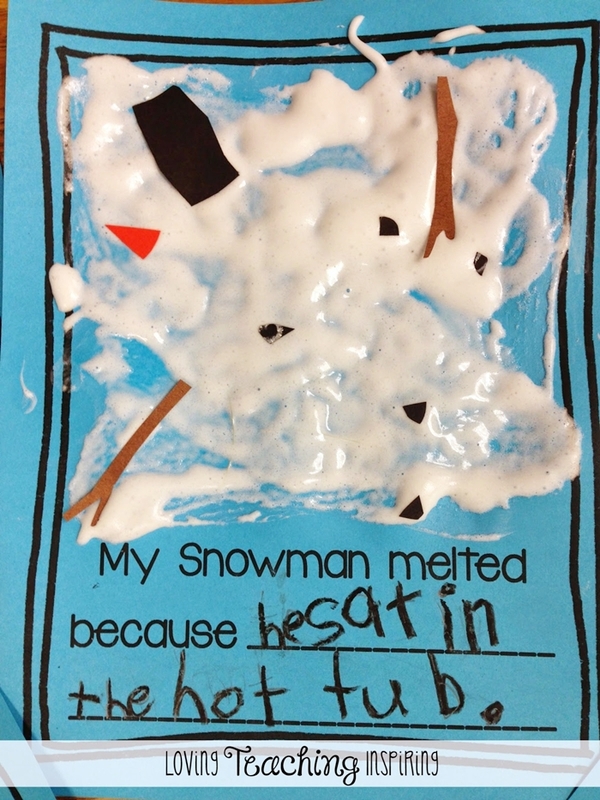 You could also have your kinders write a sentence coming up with a new reason that the snowman melted (like ate hot soup) or recall one instance from the story to add to their craft. Have your students make a puffy painted version is a melted snowman. This is a more hands-on version of the previous craft. Using a combination of shaving cream and glue, you’ll get just the perfect fluffy snow effect for your students writing piece. Have them cut out their own snowman hat, eyes, sticks, nose, etc. to make a cute melted snowman. A free template of this craftivity is available. 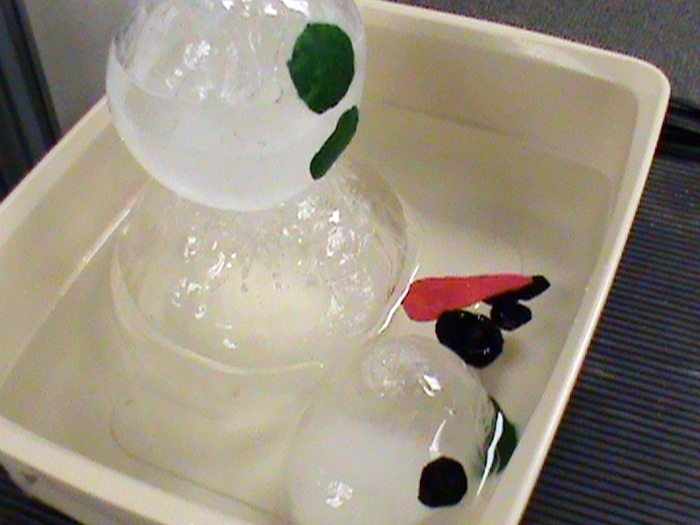 One of my facebook readers mentioned that her class’ snowman parts didn’t stick well once the puffy “snow” dried – so be prepared to add a few dabs of glue to hold them in well. 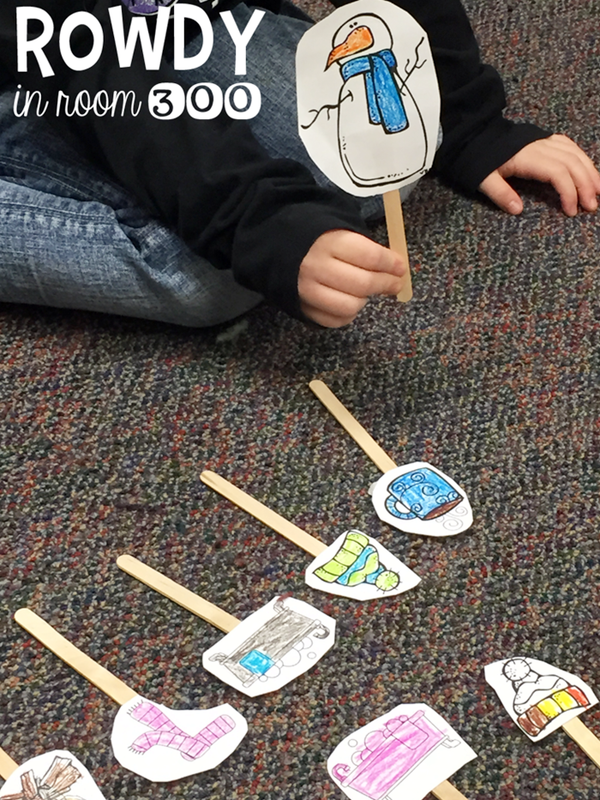 Retell Sneezy the Snowman with printable pictures. Students can retell the story or sequence the story by using pictures on popsicle sticks or a worksheet. This is a free download that your kinders can color and take home. 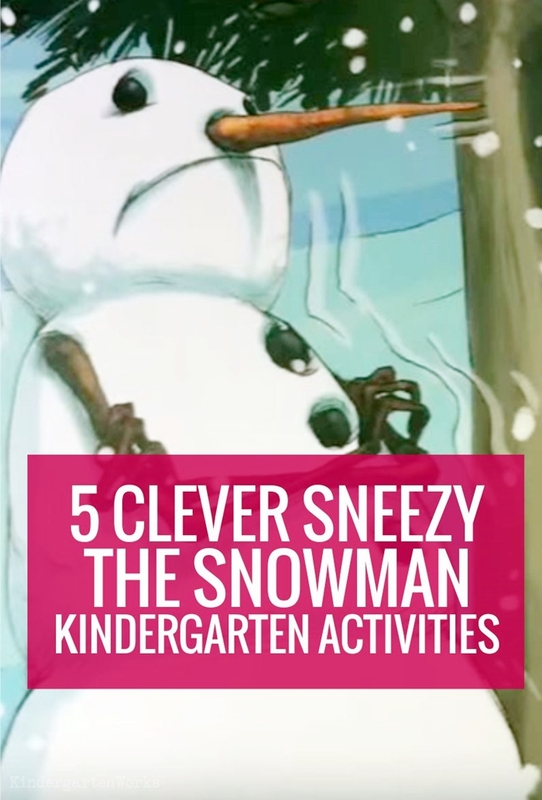 After you’ve read aloud the book to your class, include this Sneezy the Snowman video in your listening center or play it when everyone is coming in from recess as a transition. Have students identify both the pattern in the story and the problem/solution by doing movements while watching. Explore the scientific side of snowmen – namely the water cycle. This life cycle of a snowman experiment is perfect for students to observe and record their findings. You’ll love what they discover about water in the form of a solid, liquid and gas! While it may not be exactly what happened to Sneezy, it’s a neat extension activity that they will love. And for good measure – if you’re looking for directed drawings for winter – I like this snowman directed drawing activity. There you have my top picks for teaching Sneezy the Snowman in the kindergarten classroom. I hope having these activities, free printables and video all in one place saves you time lesson planning. 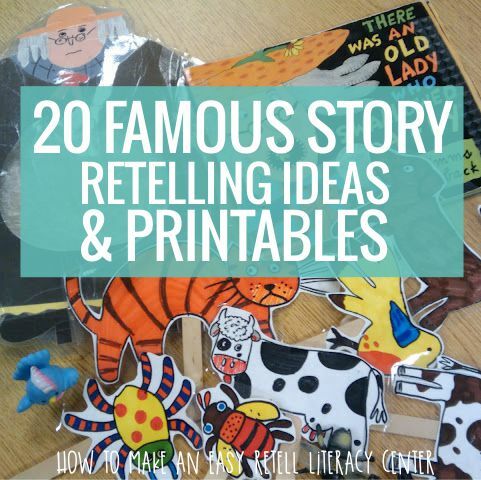 If you need more stories that are perfect for retelling in kindergarten, check out this crazy popular list of 20 famous story retelling ideas and printables.